Coming soon from The Ministry of Whimsy! All proceeds from this book will go to ProLiteracy, an organization that "champions the power of literacy to improve the lives of adults and their families, communities, and societies." 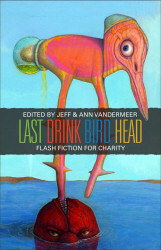 LAST DRINK BIRD HEAD will be launched at World Fantasy Convention. Check out Jeff’s blog for details about the launch party. ORDER NOW TO RESERVE YOUR COPY AND TO SUPPORT A GOOD CAUSE. contributor or editor or available for pickup at WFC.